Happy Monday! I hope everyone had a lovely time celebrating the holidays in your own style. For the first time ever, Tyler & I decided to stay in Nashville over my Winter Break, & while it is hard to be away from family, it has been so restorative! We got to see my whole family over Thanksgiving, & we will be seeing all of Tyler's family throughout January, so for now, we are enjoying our us time! Thank you for all the feedback on my Shopping vs. Style post. I often struggle putting my thoughts into coherent sentences & appreciate those of you who took the time to read & comment in response. In addition, I spend a significant amount of time working on my blog, & I totally understand the drive for bloggers to make money off of their sites - in fact, bloggers that pull off sponsored posts WELL are very impressive, that is no easy feat. As a blog reader myself, I know that readers can tell when what the blogger is sharing is just for money, & greatly appreciate genuine posts that share an original outfit, styling tip, or must have product that they just can't shut up about. I write my blog like I'm talking to my girlfriends & am excited about exploring some new projects to share in 2016! One of the topics that was a driving force for the creation of Here&Now, was the idea of curating a versatile wardrobe built around a foundation of "closet staples". If you haven't been here since the beginning, you can read more about my Closet Staples series. I also want to make this topic come back to the forefront of my blog content, so I'm putting that into practice today! Let's talk about coats. 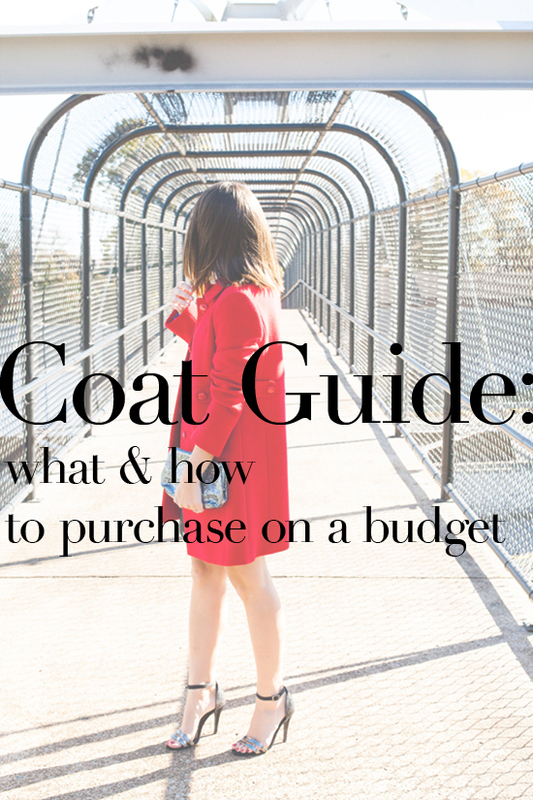 Coats are capable of not only taking up a large footprint in your closet, but they can also eat up a large portion of your shopping budget. This is the first year where I have felt completely equipped with the coats I already have, & wanted to share the ones I consider my staples, how I purchased them while sticking to my budget, & share some similar styles if you are looking to add to your coat collection this season. I can't remember exactly when I purchased this J.Crew coat, but when it first appeared on my blog in 2011 (outfit here), I listed it as being old, leading me to believe that it must have been at the end of college or beginning of my grad school years. What I do remember about this time in my life, is that my shopping budget was almost nonexistent, & this was a major purchase for me! 1. Go for an eye catching color! 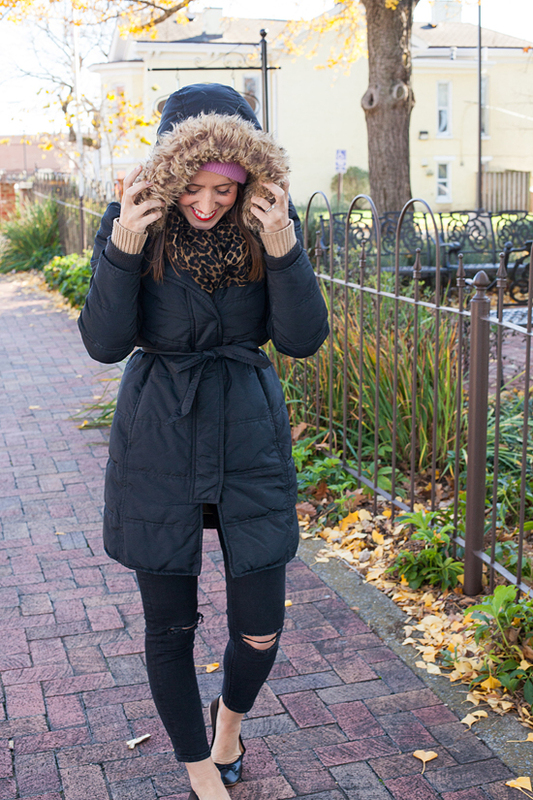 Since this isn't going to be your everyday coat, you won't be held back by going bold. 2. Look for tailored cuts. This coat is almost always covering dresses, & I don't need for it to accommodate bulky sweaters or layers (probably also helped by my living in the South). This coat is slim cut, & I like that when I button it, it gives me an hourglass look, with the tucked in waist detail. 3. Think about length. Too short (like a pea coat type style) & it looks like you took a jacket from a child, too long, & you come off looking like you might be naked underneath. This style falls right at the same length as most of my dresses, just a couple of inches above the knee. The exact style of my jacket is the J.Crew "lady day" coat (now on sale & available in 5 colors!) & J.Crew Factory also has a similar style (currently only $115). If you have your heart set on a red one (I LOVE that I chose red), this one from Guess comes in petite sizes & this ASOS one has a fun mod feel to it. Note: many of these styles are currently on sale & the sale price is not reflected in the prices below. This is one of those pieces that I never realized how much I would wear it when it was initially purchased, but this has come to be my everyday work coat. I love that I can throw it on over anything, it is warm & so far nothing any kid has tried has damaged it (the color surprisingly hides stains, including the full iced coffee that a kid spilled on me a few weeks ago). 1. The cut is generous enough to allow for bulkier under-layers (even the arms, which is pretty rare!). I have worn a tee, sweater, & down vest under this baby & not looked like I was smuggling honey hams. 2. The neutral color goes with everything, and I like that it doesn't stand out too much, allowing me to style it with many different types of accessories to get many different looks. It can be equally sporty or glam depending on the finishing touches. original post here. 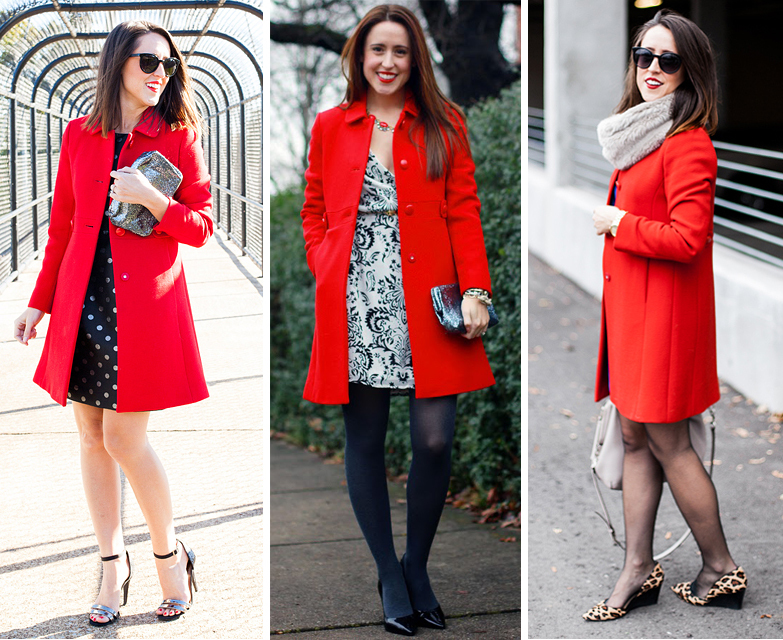 See all the ways I've worn this coat here. My exact coat is still available from Chicwish, & most of the styles linked below are currently on sale (click through to see the sale prices). I just saw this style in person at Old Navy & the sherpa texture is much softer than it looks in the online photos. For some reason, the faux fur coat reminds me of Audrey Hepburn, a little cheeky, always sure to draw compliments from strangers. And dang, it is cozy! 1. It is easy to look like a muppet when your whole upper half is covered in faux fur. To differentiate yourself from Elmo, fit is key! You don't want to be swallowed, sleeves should be tailored, & length kept in mind. 2. If you want to wear this style often, a neutral style might be your best bet. For me, leopard is a neutral & I am always surprised by the versatility of my leopard faux fur jacket. 3. Keep your faux fur looking well loved by treating it to a dry cleaner's trip at the end of each season. Sorry, but unless you are doing spot cleaning, this is a style that will need to be taken care of professionally. The style most similar to mine is this leopard coat from ASOS. If I was going to pick up another faux fur coat (I would have to figure out a way to sneak it past my husband first…) would be this glam neutral number from Ann Taylor - so chic (& 60% off with code WINTER60)! 1. The main mistake you can make when purchasing a puffer coat is not getting one with a belt or some middle defining detail. A waist defining feature will take you from the Ghost Busters Marshmallow Man to a stylish lady on the go in 2 seconds flat! 2. One other thing that I didn't even realize I liked about my own coat until I saw it on other people, is the outer fabric isn't shiny. I think the flat black color makes it very polished! What are you mainstay coats? How did you select the coats hanging in your coat closet? And tell us your tips for getting them on sale!